Training on ‘Silviculture and Forestry’ for Personnel of Eco Task Force –Eco Battalions of Territorial Army of India One week training on ‘Silviculture and Forestry’ for the Personnel of Ecological Battalion of Territorial Army is being organized by the Silviculture and Forest Management division of Forest Research Institute at Dehradun from 26th- 30th November 2018. This course is a joint venture of FRI, Dehradun and 127 Infantry Bn. Ecological (TA) Garhwal Rifles, Dehradun and in this training programme about 37 personnel including Officers, JCO,s and Jawans from 10 Eco Battalion of Territorial Army from many regions the country e.g. Assam, Delhi, Rajasthan, Shimla, Sambha, Chennai, Allahabad, Maharashtra are participating. 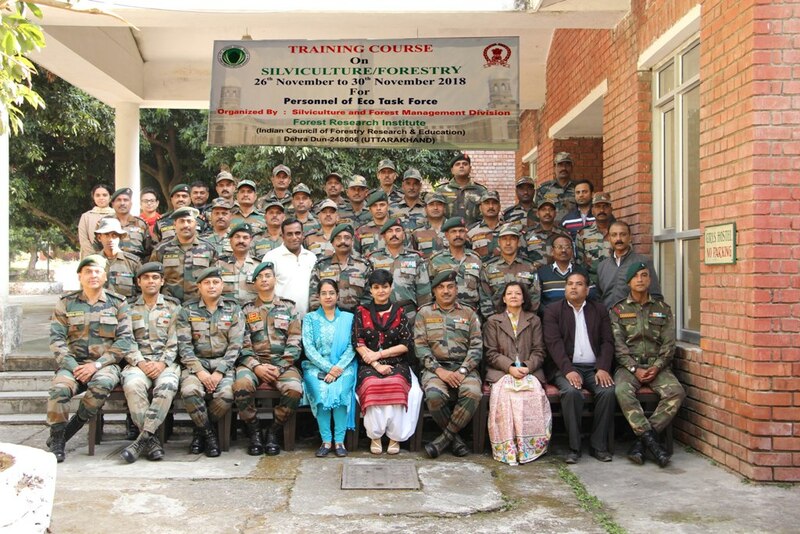 During the inaugural session of the training course, Dr. Savita – Director FRI said that Eco battalions of Territorial Army are doing commendable work on afforestation of degraded, disturbed and difficult sites and this training will provide scientific inputs on silvicultural aspects like seed collection, quality evaluation, nursery raising and plantation establishment and management. Lt. Col Bannerjee from 127 (TA) Dehradun conveyed the importance of this training programme to the participants. Mrs. Arti Chaudhary Head Silviculture and Forest Management division welcomed the participants and said that during this course apart from lectures, visits to nursery, laboratories and experimental sites will also be conducted. Earlier Dr. Manisha Thapliyal, Course Coordinator gave a detailed report of the course and told that more emphasis is being given to practical exposure in seed handling, nursery establishment and plantation activities. The training module includes the techniques of seed dormancy pretreatments, seed storage, clonal propagation of bamboo, nursery techniques of important tree species of Assam, Rajasthan, Uttarakhand, HP and J&K. The training lectures also include soil fertility management in nursery and plantations, afforestation of difficult sites and management of fungal and insect-pest diseases in nursery & plantations, propagation of medicinal plants, visit to common facility centre for bamboo processing and treatment, etc. The participants would also be visiting the various museums of FRI, to gain knowledge on history of forestry/silviculture and other sciences.